1) Loss of high frequency response due to cable capacitance. 2) Loss of signal level and high frequency response due to impedance effects. 3) Signal degradation caused by the design of the circuitry in the effects device. The VALVULATOR I solves all three of these problems using a vacuum tube based Buffer circuit to change your guitar signal from high impedance to low impedance. This low impedance signal is better able to survive the trip from your instrument to your amplifier, including all of the detours in between. You will be amazed at the renewed responsiveness of your instrument as well as the effect on your playing. In addition, the VALVULATOR I input stage utilizes the same circuitry as that found in the input stage of most guitar amplifiers. This means you get the same dynamic feel from your instrument as you would if you were plugged directly into your amp! Now that you have solved the signal loss dilemma, how do you keep your stompboxes operating at peak performance so your sound will always be there when you want it? The answer is to regulate the power going to the stompbox to insure that it will always be exactly the same voltage, no matter where you are. The Valvulator I provides four regulated and isolated outputs which will supply you with all of the clean regulated power you need to insure maximum signal output and frequency response from you pedal devices. And because the power supply outputs are individually isolated, you never have to worry about ground loop hum. 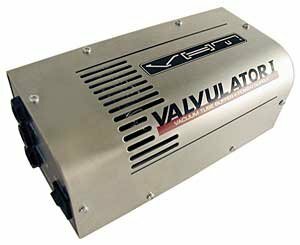 The VALVULATOR I runs on standard AC wall current, NO WALL WARTS, and is housed is a rugged steel chassis topped with a sleek stainless steel vented cover. SIZE: 6-3/4”W X 3-1/2” H X 3” D.